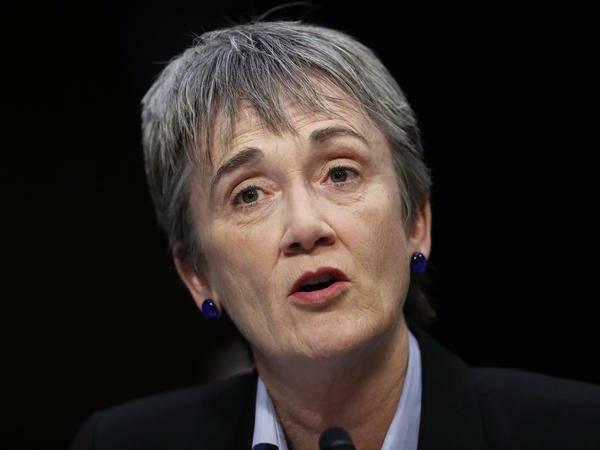 Air Force Secretary Heather Wilson, shown here at a 2017 hearing on Capitol Hill in Washington, has said she plans to resign. "It has been a privilege to serve alongside our Airmen over the past two years and I am proud of the progress that we have made restoring our nation's defense," she wrote. "We have improved the readiness of the force; we have cut years out of acquisition schedules and gotten better prices through competition; we have repealed hundreds of superfluous regulations; and we have strengthened our ability to deter and dominate in space." It is space – in particular Trump's desire to a create a space force – that Pentagon sources say produced tensions between Wilson and the White House, who saw her as delaying the process. At the same time, Wilson was seen at one point as a contender to fill the role of secretary of defense. Patrick Shanahan, now the acting secretary of defense, has been more openly supportive of the idea of a space force. In a memo last September, Wilson said creating a space force would cost about $13 billion over five years. "The costs here are additive costs," she told Defense News. "To stand up a department that's responsible for recruiting and training and planning and programming and budgeting and all of the leadership requirements that a department has, it's a major undertaking. It's a bold idea." Last month, the administration said the space force would be under the umbrella of the Air Force, at least temporarily. That was a shift from the "separate but equal" branch that Trump had initially proposed. Wilson inherited an Air Force involved in numerous major airstrike campaigns. "On many occasions, Wilson sounded the alarm about an overstretched Air Force — especially after years of sequestration-driven cuts — and worried that airmen were being asked to do much," Air Force Times reported. "In a November 2017 press conference, Wilson and [Chief of Staff Gen.] Goldfein worried that repeated deployments were going to burn out airmen and could even break the force." Wilson, who graduated from the Air Force Academy and was an Air Force officer during the Cold War, had been leading the South Dakota School of Mines & Technology when she was tapped for this position. She's a Republican and represented New Mexico in Congress from 1998 to 2009. She ran twice for Senate, in 2008 and 2012, and lost both times. The University of Texas board of regents said in a statement that they unanimously voted in favor of Wilson on Friday. "Dr. Wilson's broad experience in the highest levels of university leadership, and state and national government– whether securing federal grant awards, advising our nation's most important national research laboratories, raising philanthropic dollars or running large, dynamic organizations – will help ensure that UTEP continues its remarkable trajectory as a nationally recognized public research institution," Regents' chairman Kevin Eltife said.